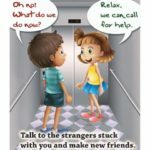 Scenario: What should you do if you are stuck in a lift, either alone or with others? — In case of a power failure find a light source such as a torch, a mobile phone light or even torch app in a smart phone. Illumination will help you register where the control panel is, who you are with. — Immediately press on the button with a speaker or phone symbol, to raise the alarm. If you receive no response from the other end then you can call an emergency number or someone else who may be present in the facility. — Depending on your mobile signal strength and your phone battery condition, try and call but if you’re unable to get through because of bad signal coverage send text messages to multiple people who may be able to help raise the alarm. — If you catch a Wi-Fi signal you can try and send out an email to someone you know, don’t hesitate to send one to your entire organisation asking for help; make sure your subject line indicates the urgency “Help: Stuck in Lift, Call Emergency”. — If all means of communication fail then bang on the elevator door to raise the alarm. If you are with a group of people take turns at doing so without expending much energy. This is particularly important if you are stranded for an extended period of time. — Do not try to escape through the emergency hatch on the roof on your own initiative. — Do not try to slip through the gap if the elevator is caught between floors and the doors open, unless there is clear guidance from an expert and they have secured the elevator in its current position.— Wait for assistance if the doors don’t operate after attempting every button on the panel. Do not exert yourself too much, preserve as much energy as you can, as you don’t know how long the situation could last. Loosen any tight clothing and if the weather is hot then shed some of the heavy clothing such as a coat, a shawl, etc. Sit on the floor if you can. Remove high heeled or constricting shoes. If you happen to have water or snacks on you save them for when you truly need them or share with another person if they are suffering medically. Talk to others around you, silence creates unease. Ask those with you if they have any special medical needs, that you may facilitate if needed. If you or someone with you is claustrophobic, try to calm them down but also avoid crowding them. Advice: Modern elevators rarely fall as they are produced with multiple safety measures to prevent such a situation. However older technology using and/ or ill maintained elevators have been reported to crash though this is still extremely rare. The construction of modern elevators is such that in the event of a crash the floor crumples, as part of the technology, to absorb the maximum impact. To walk out unharmed in a free falling elevator would require a miracle therefore the aim should be to limit injuries. — Do not hold on to the sides of the elevator that raises you off the floor. — Do not hang from the ceiling. — Do not position yourself on top of another person. — Protect your head by covering it with your hands and positioning it close to your chest, similar to the brace position in a plane. — Do not hold on to your possessions or use them to protect yourself during the fall, items among the possessions, such as pens, or other sharp objects could pierce you causing more harm. — Position yourself to the side of the elevator as the brunt of the force is felt in the centre. Remember: if you have the option use the stairs, do so; it’s healthier and safer, especially where the condition of an elevator appears to be far from ideal.